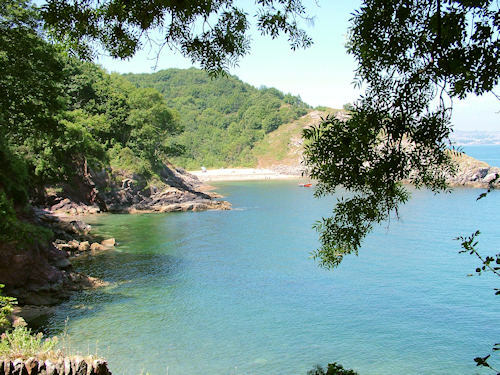 Churston Cove is another one of South Devon’s picturesque beaches, set in a sheltered cove, away from the main tourist beaches. As one of The English Riviera’s ‘secret’ beaches, it offers plenty of photo opportunities and a less crowded beach, even on sunny days in the summer. Churston Cove shares the sheltered bay with Fishcombe Cove which sits next to it. Both beaches are popular with yachts which moor up for shelter and a spot of lunch. Another visitor is a seal who frequents the waters. The cove is on the coastal path between Brixham and Paignton, so walkers will cross it on what is a lovely coastal walk with many sea vistas. Behind the beach lies Churston Woods which are home to interesting wood sculptures and woodland walks which lead inland to the village of Churston which is home to Churston Court, a 12th Century listed Manor House Hotel and pub. The cove is only accessible by footpath which is undulating and can be muddy following rainfall. From Brixham there is on-street car parking on the roads approaching Fishcombe which is a 15 minute walk away, and undulating. Alternatively you can park around Churston and walk through the woods, a good 20-30 minutes away. From the other direction, you can park at Broadsands and follow the coastal path around, but this is going to be a much longer walk, at least an hour’s walk. Churston Cove is a mainly pebble beach flanked by rocks offering great vantage points looking towards the entrance to Brixham harbour. There are no facilities on the beach due to it’s relative inaccessibility.